Off the coast of England is a tunnel or door made of limestone rock called durdle door. The door sits in the ocean, near a beach, which is also surrounded by rocky hills. The word “durdle” means drill in Old English. You might have seen Durdle Door in the movie Nanny McPhee. Lots of people come here to visit and picnic every year. Durdle Door is owned by a private family. The family owns over 12,000 acres of land around the area. Off the coast of England is a tunnel or door made of limestone rock called durdle door. The door sits in the ocean, near a beach, which is also surrounded by rocky hills. Durdle Door first began forming over 140 million years ago. This natural wonder was made by the sea slowly forming and shaping the rock. 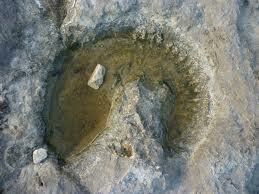 You’ll see donut-shaped imprints in the rock at Durdle Door. These are fossils of an ancient forest. All About Durdle Door: At its tallest point, Durdle Door is 200 feet. A video tour about the location and facts about the Durdle Door. Question: How tall is the arch at Durdle Door? Answer: At its tallest point, Durdle Door is 200 feet. 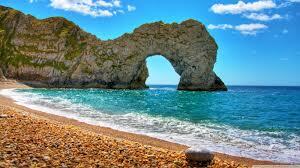 Enjoyed the Easy Science for Kids Website all about Durdle Door info? Take the FREE & fun all about Durdle Door quiz and download FREE Durdle Door worksheet for kids. For lengthy info click here. Declan, Tobin. " Durdle Door Facts for Kids ." Easy Science for Kids, Apr 2019. Web. 25 Apr 2019. 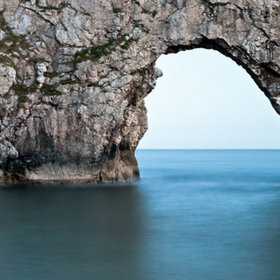 < https://easyscienceforkids.com/all-about-durdle-door/ >.